According to a new Ontario survey conducted by Abacus Data, the Ontario Liberal Party is likely headed towards a third consecutive election victory however it is unclear whether the lead will be enough to propel them into majority territory. As we have done all throughout the campaign, Abacus Data measured vote intention in two ways: first respondents were asked how likely they were to vote for each of Ontario’s main parties and second they were asked how they would vote if an election were held tomorrow (the traditional ballot question). The results of both questions suggest that the Liberals have taken the lead, the PCs have stalled and fallen back a bit, and the NDP surge has hit a ceiling. Most noteworthy, it seems that the Liberals have successfully convinced voters torn between the Liberals and the NDP to come back while soft Tory voters have shifted to the Liberals. Province-wide, the Ontario Liberals have the support of 37% of decided voters, followed by the PCs at 34%, the NDP at 24%, and the Greens at 4%. One percent of decided voters said they would vote for another party. Nine of respondents said they were undecided, even after being asked if they were leaning towards a party. Since last week, the Liberals are up four percentage points, the PCs down three, and the NDP is up one. The Liberals now have marginal leads among men, women, 30 to 44 year olds and among those over 60 years of age. The Liberals are strongest in Metro Toronto and the GTA while weakest in Southwestern Ontario. The Tories continue to struggle in Metro Toronto while being strongest in Eastern Ontario. 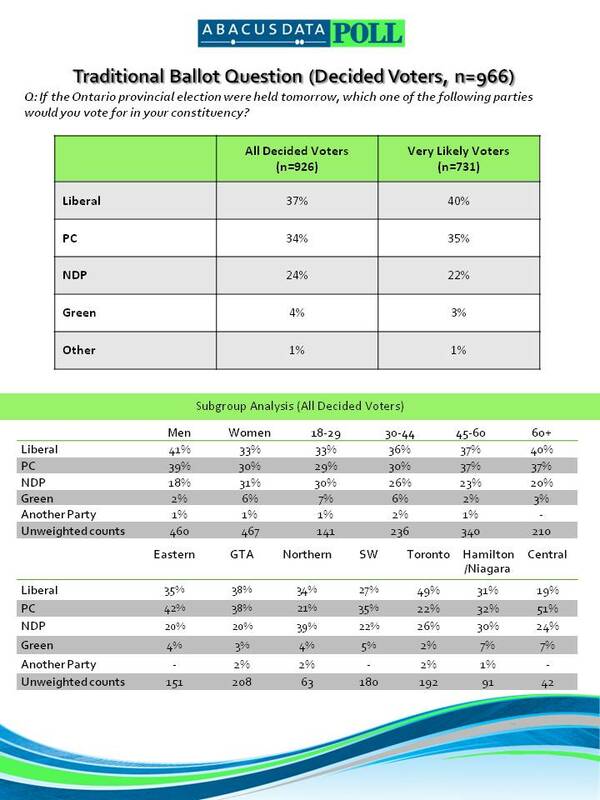 Among respondents who said they were definitely going to vote on October 6, the Liberals have a five percentage point lead over the PCs leading 40% to 35% with the NDP at 22%. Throughout the campaign, the PC Party has consistently had the most committed voters. Ontarians were also more likely to rate their likelihood to vote PC higher than any other party. However, in the last week of the campaign, there has been a shift in the strength of support.. The PC vote has remained relatively stable. However, the Liberals have been able to convince a enough of the “no-preference” voters (those who rated two or more parties equally) to vote Liberal lifting them into the lead. We noted early in the campaign that a large block of the electorate was torn between voting Liberal and NDP. It seems that since the debates, some of these voters have decided on the Liberals while the NDP’s support has remained relatively static. In terms of messaging to these voters, stability seems to have beat out change. Much of the shift to the Liberals has occurred in the GTA (where we found a large group of no-preference voters in our 2nd wave of research). The likelihood to vote question (non-traditional question) also allows us to understand the potential for each party to grow. The results from this wave of research are almost identical to those from our first wave of research early in the campaign. The Liberal Party now has the largest block of voters who said they are likely (8-10 on 10-point scale) to vote for the party increasing the pool of likely voters from 23% to 26%. The PCs are down somewhat from our second wave of research while the NDP has held steady at 18% throughout the campaign. The Abacus Data survey also reported a number of other findings. Best Premier – Three in ten Ontarians considered Dalton McGuinty to be the leader they thought would make the best premier (30%), followed by Tim Hudak (21%), and Andrea Horwath (19%). 30% were unsure. Leadership favourability – Andrea Horwath remains the most favourably viewed political party leader however Dalton McGuinty’s favourable impression improved somewhat since the previous wave of research: McGuinty 37% fav/45% unfav, Hudak 32% fav/48% unfav, Horwath 48% fav/18% unfav. Top issues and party scoring – Managing the economy, keeping taxes low, and reducing hospital and surgery wait times were identified as the top three issues that would impact respondents’ votes. When asked which party was best at managing the economy, the Liberals and PCs were tied – 41% for the Liberals and 40% for the Tories. This is an improvement for the Liberals since the first wave of research. Direction of the province – Ontarians surveyed were split on the general direction of the province. 40% believed the province was headed in the right direction while 40% believed it was headed on the wrong track. 20% were unsure. State of the Ontario economy – When asked to describe the current state of the Ontario economy, a majority (54%) described it as “ok” while 20% considered it to be very good or good, wile 26% considered it to be poor or very poor. This measure was a better predictor of vote choice than general direction of the economy. Predicted election outcome – When asked what they thought the likely outcome of the election was, the plurality of voters believed the result would be a Liberal minority (41%) followed by PC minority (23%), Liberal majority (10%), and PC majority (7%). 11% were unsure. On October 3 and 4, 2011 Abacus Data Inc. conducted an online survey among 1,001 randomly selected Ontario adults from a representative online panel. Although there is no margin of error for non-probability sampling, a sample of 1,015 has a margin of error comparable to +/- 3.1%, 19 times out of 20.